Graphic designer Paula Scher adapted Piet Mondrian’s 1943 painting Broadway Boogie-Woogie when she created the graphic identity for Manhattan Records in 1984. On each LP that Manhattan Records released, the design is printed on the center label of sides A and B. When reflecting on her decision to turn to Mondrian, Scher explained “the strongest attribute was that the painting’s color blocks could easily be reconfigured for a multitude of uses.” It’s fitting then that variations on the above design were also used for the company’s record sleeves, business cards and letterhead. Manhattan Records was an east coast branch of Capitol Records, and since it was named after New York’s most densely populated borough, Scher knew the design had to represent the city. In her book Make It Bigger, Scher explains that during the planning phase, label founder Bruce Lundvall asked for “a painting or a photo of a skyscraper as the predominant image.” Her decision to adapt Piet Mondrian was not what Bruce Lundvall was expecting. Mondrian’s painting, as the title suggests, has musical connections of its own. Several decades before Paula Scher adapted Broadway Boogie Woogie for the record label, Mondrian wrote about how both jazz music and the grid system of Manhattan’s streets inspired his painting. Musicologist Kelsey Kline writes that in Broadway Boogie-Woogie, “the lines and blocks of colors pulsate in time… [and] the varying short and long distances between the rectangles sound the rhythm of the piece.” In 1940, Piet Mondrian wrote that “boogie woogie is pure rhythm,” and it seems that the rhythms of jazz found form in his painting. Syncopation allows a jazz musician to emphasize beats that would typically be unaccented. In the same way that a syncopated beat can break the monotony of a metronome, Mondrian’s colored blocks break with the monotony of a basic grid. Syncopation adds color to music, and for Mondrian, the placement of the colored blocks is what makes his work musical. The connections that Piet Mondrian and Paula Scher made between the visual and the sonic are clear. Scher explained that “the logic of using this painting as an identity for Manhattan Records was obvious: it ostensibly represented Manhattan and was inspired by music.” Though Manhattan Records went on to release pop, rock and dance music, it is fitting that some of the label’s first releases with Scher’s design were jazz recordings: Cielo e Terra by Al di Meola and Made in New York by Tania Maria, both released in 1985. That same year Manhattan Records relaunched the famous jazz label Blue Note Records as a subsidiary. 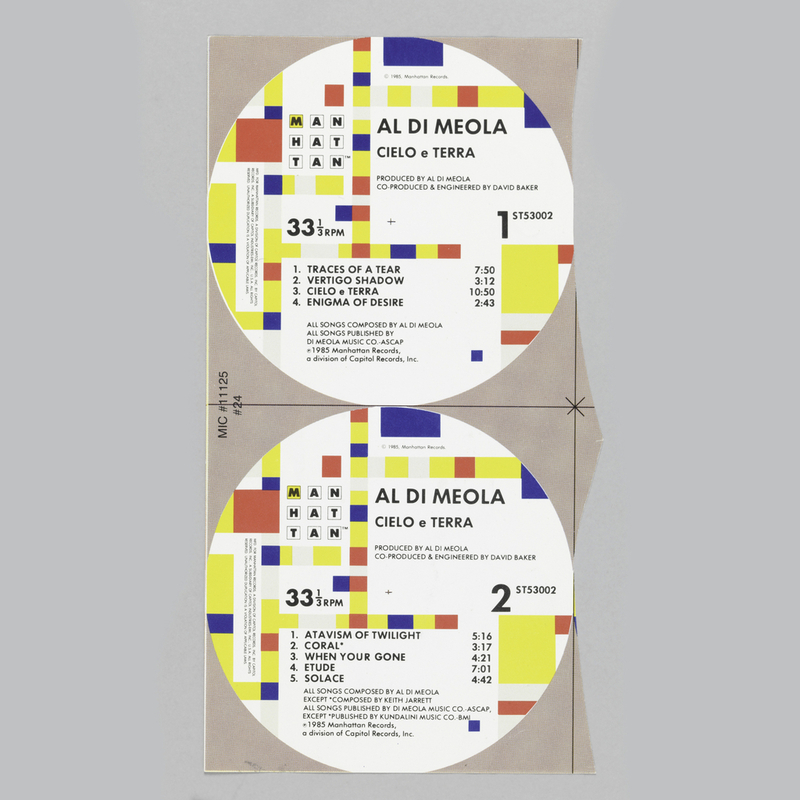 Just as Piet Mondrian tried to depict the sound of New York in the 1940s, Paula Scher successfully adapted Mondrian’s work for a label that released music centered in New York some forty years later. Paula Scher, Make It Bigger (Princeton: Princeton Architectural Press, 2005), 70-76. Kelsey Kline, “Rhythm and Color in Art As Influenced By Jazz.” Metamorphosis. 2010. James Leggio, Music and Modern Art. (Abingdon-on-Thames: Routledge, 2001). 185.